What do you get when you mix the freakish, unusual, unconventional, inappropriate with the beautiful, elegant and traditional Easter wear? 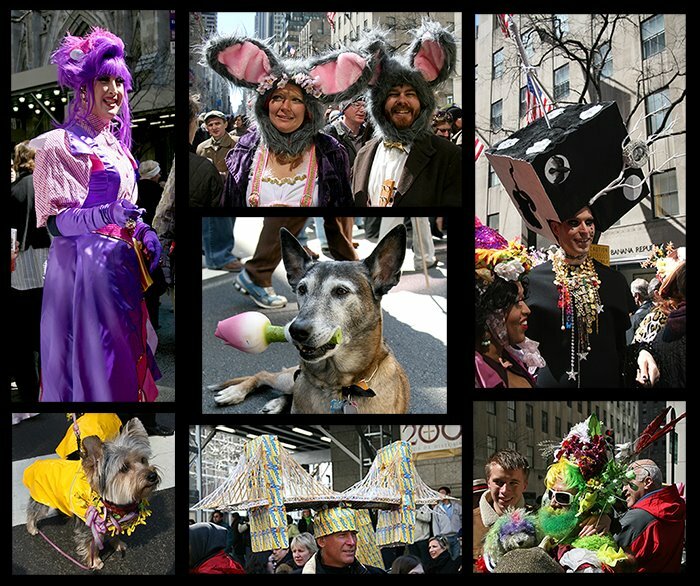 Why a New York Style Easter Parade of course. If you have any event in this city, you had better expect anyone to show up. There was no shortage of drag queens, transvestites, eccentrics or the macabre - at various moments I felt like I was at the Village Halloween Parade. In fact, the person at the lower right in the photo appears regularly at every parade including the Halloween and the Coney Island Mermaid Parade. It was quite a juxtaposition with St. Patrick's Cathedral as backdrop. I'm sure many of the themes and wardrobes were not sanctioned by the Roman Catholic church. This is my third year at the NYC Easter parade and I have featured the more unusual participants in the main photo. For a series of photos from the parade of the beautiful and floral, please go here. Related Postings: Easter Parade 2006, Easter Parade 2007, Spring Madness, Peeps, Mermaid Parade 2006, Mermaid Parade 2006 - Part 2, Mermaid Parade 2007, Mermaid Parade 2007 Part 2, Halloween Parade 2006 Preview, Halloween Parade 2006, Halloween Parade 2007 Preview, Halloween Parade 2007, Halloween Parade 2007 Part 2.